Nakajima is a one Michelin starred restaurant, serving affordable sardines set menu. On the same street, as you wait and queue, buy a coffee from Sarutahiko Coffee. We arrived at Nakajima slightly before noon, and there was a queue. While my partner was queuing for Nakajima, I went to get coffee next door at Sarutahiko Coffee, which is named after a guardian deity from the Shinto religion. On their website via google translate, they want to aim for “tatara,” which is a “cup full of happiness.” And they have achieved it. It has to be the best coffee I had in my life. The coffee starts from ¥380 to ¥ 550. The most expensive is a drip coffee called “thin red line” at ¥980, which is about S$12. No way am I getting a cup of coffee at $12. That’s the price of the meal at Michelin-starred Nakajima. We got the pumpkin latte (¥520), aka The Best Decision I Made in My Life. We waited 15 minutes for it, although there was no crowd. By the time we got the coffee, the queue at Nakajima had already moved by half. As a result, the coffee has ZERO bitterness. It’s medium bodied, naturally sweet, and extremely smooth. It was so addictive we finished it in seconds. The story started with the grandfather. It’s a grandfather story. The grandfather Teijiro Nakajima was the head chef of Hoshigaoka Saryo, a prestigious fine-dining restaurant opened in 1925. Teijiro’s son branched out and open Nakajimi in Shinjuku. The current owner, Sadaharu, is the third-generation chef. Their website claims that their specialty is owan, which is the soup dish as part of the kaisaki course meal. 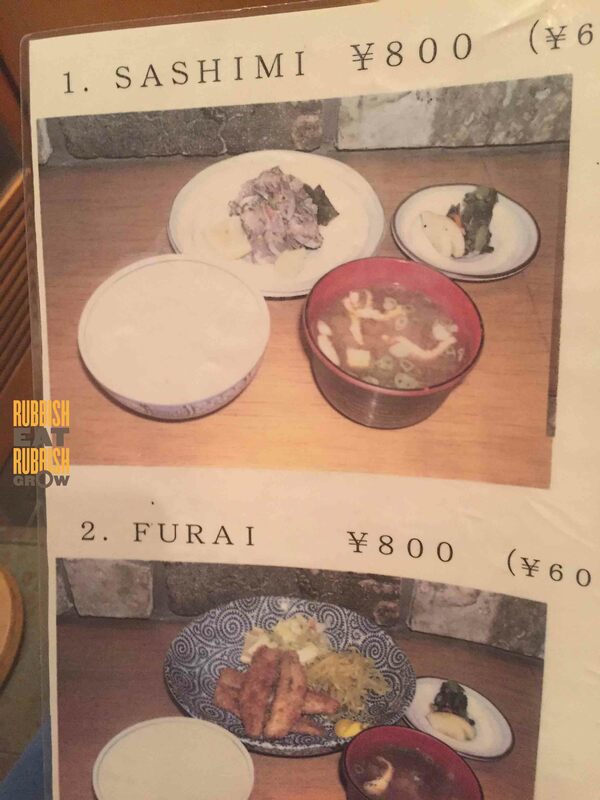 But to enjoy the owan, you have to go for dinner, which starts at ¥8000 to ¥19000. Do you have money to burn? Because I don’t, so we went for lunch, which is cheaper than a cup of Sarutahiko drip coffee. The lunch menu (click to enlarge) is very simple. 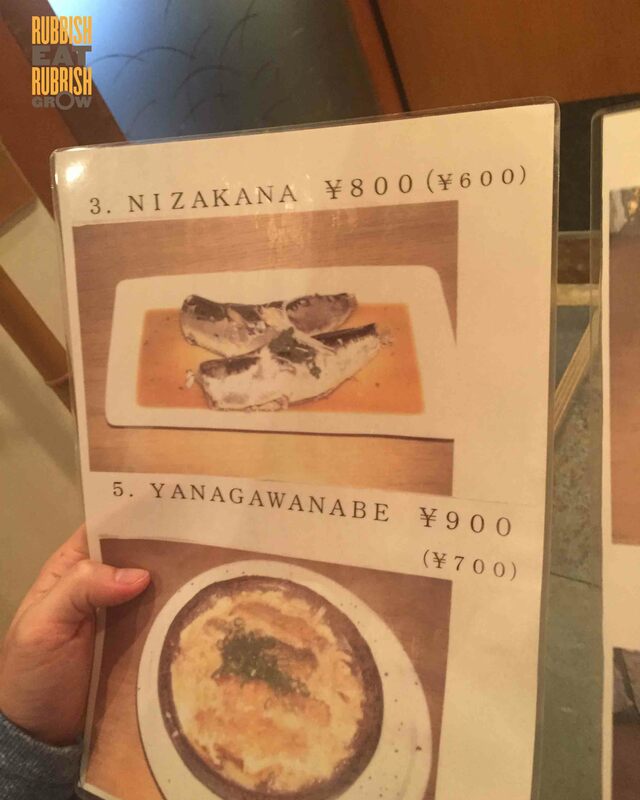 There are only 4 options, sardines done in 4 ways: sashimi (¥800/¥600), deep-fried (¥800/¥600), boiled with soya sauce (¥800/¥600), and yanagawa nabe (¥900/¥700). Yanagawa nabe is like a casserole dish; the sardine is first deep-fried, and then stewed with egg and onion. The ¥800 option comes with rice, soup, and a side dish. The cheaper price ¥600 just comes with sardines. The rice is refillable, and you should refill, because the rice is nacreous and fluffy. Fantastic. We arrived slightly after 11.30pm and there was already a queue. But it moves quickly and we queued for about 30 minutes. But if you arrive at 12.30pm and after, there is no queue. The cosy restaurant consists of bar seating with a few private rooms. We ordered the yanagawa nabe, the sashimi, and boiled with soy sauce. They are excellent. The yanagawa nabe is the best; the sardines soak up the umami of the sauce. The deepfried sardines contrasts beautifully with the spongy egg. Both sashimi and soya sauce are good too, but there are so many bones in them. Sardines bones can be eaten, but they are hard and prickly, making it uncomfortable to bite. But tastewise, they are outstanding, well-balanced. This is an amazing meal for ¥800. Super duper delicious, and definitely good value. We highly recommend it. Cash only. We pay for our own meals. NOTE: No children under 6 is allowed into the restaurant.